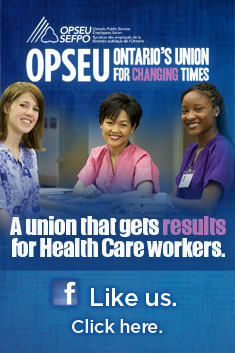 Today OPSEU’s Health Care Divisional Council’s Diablogue posted its 500th story since beginning in January 2010. The HCDC blog was intended to create a dialogue on public health care policy – and that it has done. Diablogue is now read by a diverse and informed community including journalists, policy makers, think-tanks, academics, researchers, hospital CEOs, community organizers and OPSEU’s own 36,000 health care members. Comments are on the rise as many of these readers have contributed their own insights for discussion. Thank you! Our readers tell us regularly that the site is both entertaining and informative. We try hard to cut through the jargon-filled health care system to distill issues of importance to our readership community. The 500th story – “Taxes: Let the mole people pay” — looks at the unreality of a public that demands quality public health care but insists someone else should pay for it. We also post on OPSEU’s Facebook site as well as tweet regularly from #opseu_diablogue. If there’s a story you particularly agree with, don’t hesitate to share it with others. Whether you agree or disagree, leave us a comment! The Diablogue recently began a French language counterpart to extend our conversation further. Here’s looking forward to the next 500 posts. This entry was posted in Health System and tagged Diablogue 500th post, OPSEU Health Care Divisional Council. Bookmark the permalink. Hello, I just wanted to add my own appreciation and regards to OPSEU Diablogue. I am a front line worker who is very interested and intrigued by the information you give. It is very nice to have information that contradicts the very right wing and anti-union data that newspapers generlly provide. Thanks — We appreciate your comment and your support.